Drag and Drop the controls from the ToolBox. Select the control and set the properties as your wish. Double click on the controls and write the code in the Code window. The above process is called as Form coding. C#.NET recognizes every form as a class. In VB 6.0, every form is known as an object for the Form class. But in C#, every form is a class; so that at run time, you can create a ny no. of objects as your wish. For example, if you want to display Login form twice at run time, you can simply create two objects and can show it. 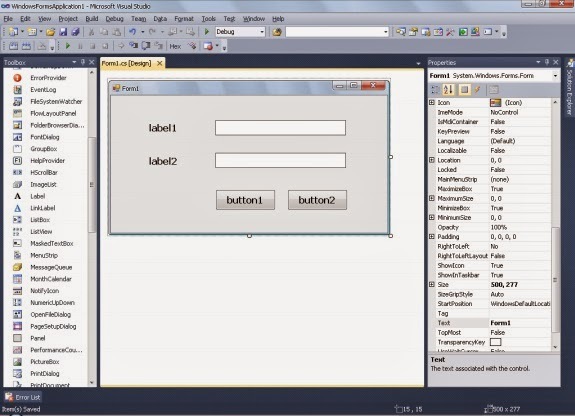 While you design the controls, the Visual Studio generates some automatic code in the “Form1.Designer.cs” file. To open this file, Open Solution Explorer, Expand Form1, then double click on Form1.Designer.cs. Don‘t worry about the above automatic generated code; it will be generated automatically, while you design the form in the Design window. The entire code is generated in a method called InitializeComponent(). 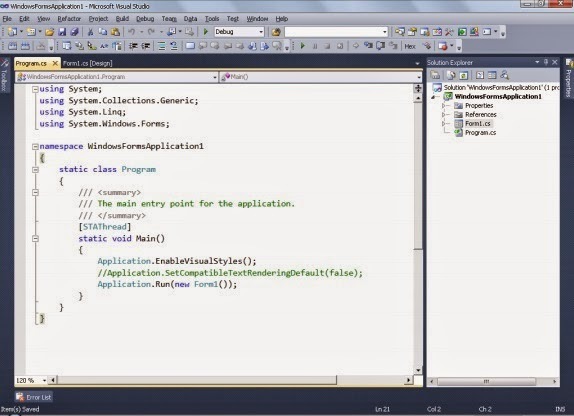 Contains the code for designing (Automatically generated code by Visual Studio). Contains the actual functionality code (Written by the Programmer). In the importing section, you can import the necessary namespaces that you want. The namespace name should be same as project name. A user-defined class with the form name is to be defined. It should be the sub class of "System.Windows.Forms.Form" class; as it offers some visual design, properties, methods and events for the user-defined form class. It should contain a constructor, with a statement called InitializeComponent();, which calls the designer code that is generated in Form1.Designer.cs file. Generally, when you Start the windows application project, automatically the Form1 will be appeared on the screen. Then don‘t think like directly Form1 will be opened. In fact, when you click on Start option, the Main() method will be invoked first. For reference you open Solution Explorer ―> Program.cs file. In the Main() method, you can see two important statements. This statement enables the better styles (for sleek appearance) for the entire application, based on the current working theme offered by the O/S. This statement creates a new Form1 class object and that object will be shown on the screen.